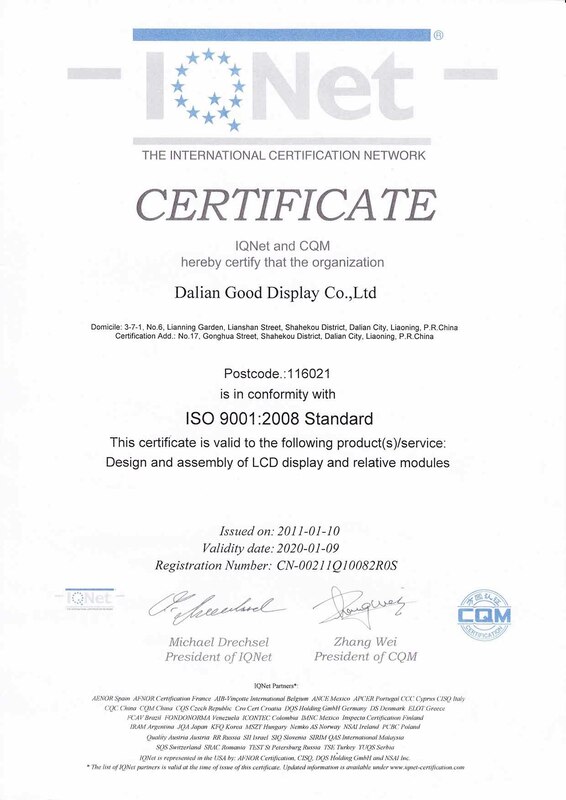 Company Overview - Dalian Good Display Co., Ltd.
11YRSDalian Good Display Co., Ltd.
Good Display is a professional LCD manufacturer in China, we specialize in providing engineered LCD solutions for both standard and custom electronic products to a large variety of markets including the OEM, medical, industrial, automotive, computer, financial, point-of-sale, aerospace, and military markets. Our engineering and sales staff can quickly respond to your requirement with a solution that fits your needs, and we will help you find and develop a LCD solution perfect for your application. Full Line of LCD Products We have state-of-the-art clean room facilities and production lines for LCD glass and modules with the most advanced techniques introduced from the United States and Japan. Our products include standard and customized LCD glass and modules, segment (alphanumeric) displays, dot matrix (character) displays and graphic displays (monochrome and color). 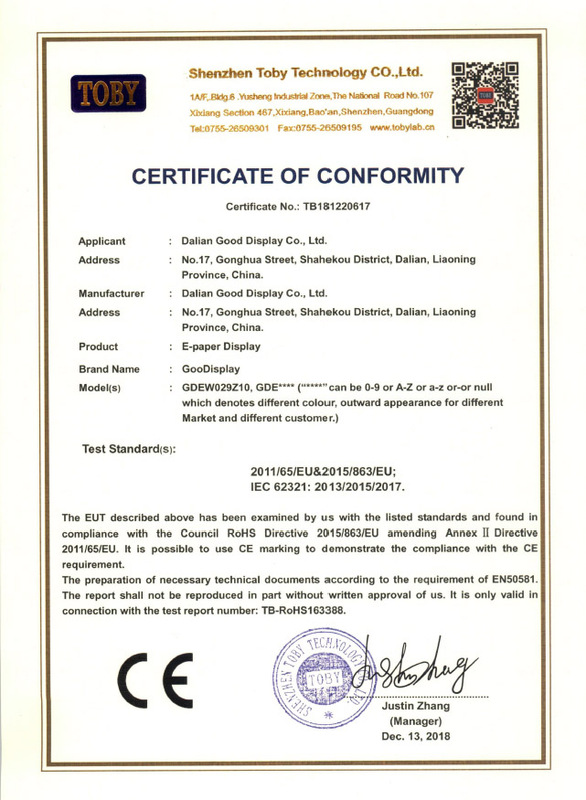 We provide a large range of LCDs with different types, including TN, HTN, STN, FSTN, DFSTN, and TFT, featuring various module mount methods such as SMT, COB, COG, and TAB.Strict Quality Control We have ISO9001:2008 and ISO14001:2008 certification issued by IQNet, and our products have become the first choice of manufacturers, engineers, developers, distributors and other business partners. Our annual production capacity is 30,000 square meters of LCD glass and 8 million pieces of LCD modules and accessory electronic products. As one of the main factories in China, we have provided our products to customers over 20 countries across Europe, Asia, and North America.Wide Application Good Display's products have been widely used in digital multimeters, electronics testers and equipment, fax machines, telephones, cell phones, public IC phones, electronic scales, digital clocks and watches, charge meters of taxis, display panels of hi-fi audio systems, POS, air conditioners, various remote controls, digital calendars, temperature/humidity displays, control boards of automobiles and motorcycles, digital meters and messaging systems, GPS devices, PDAs and mobile computers. Strength in Customization Good Display has strong capacity in making customized LCD products, including customized glass, driving circuitry of various mount types, scale boards, conversion boards, and interfacing and other peripheral circuitry. 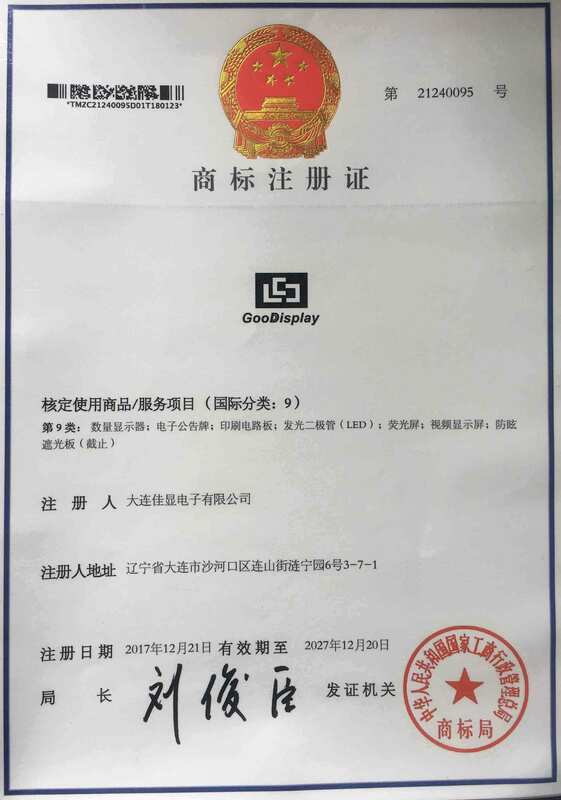 We are also one of the most flexible manufacturers in the LCD industry, changing our standard products to meet customers' requirements.Competitive Price Good Display has always been working hard to improve our productivity while ensuring high quality. The prices of our various products are the most competitive in the market. Timely Customer Service and Technical Support Our customer service representatives and technical support staff members in Good Display's headquarters, manufacturing facilities and all the branch offices are always ready to help customers with any questions about our products and possible problems involved in using them.